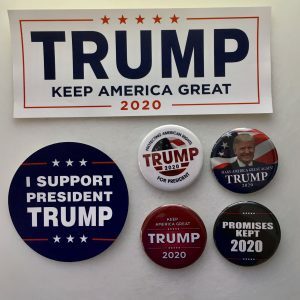 A variety of 2020 Presidential candidate combination bumper sticker and campaign button sets. These sets incluse a combination of campaign buttons and bumper stickers used for self promotion in the 2020 presidential election campaign. These beautiful item will become collectors’ items in the years to come and are 100% Made in the USA. You can support your favorite candidate by proudly displaying the stickers or you can collection them as they generally increase in value each year.